Les Walker notched up 50 years to become the state’s longest serving officer, writes Stephen Gibbs. As a young constable Les Walker had to dodge trams in a city without traffic lights when he took up directing motor vehicles through where Pitt and King streets crossed. With only one month’s initial training followed by another five weeks at the end of his probationary time, Walker had no radio linking him to back-up when first sent out walking alone on the beat. “It was a bit frightening, I suppose, for a young fellow,” he says. Five decades later as Walker’s career finally came to a close, senior police and politicians invoked Elvis Presley, Robert Menzies and Edmund Hillary in attempts to put into perspective the career of the country’s longest-serving cop. The 65-year-old retires as the only man in NSW, probably Australia, and at one estimation possibly the English-speaking world, to reach 50 years of continuous policing. The feat is so extraordinary the father of two left NSW Police as the first officer ever awarded a 50-year clasp to his National Medal. With police now routinely retiring at 55, it is not a milestone that will be reached again, as each speaker noted in an anniversary and retirement ceremony at police headquarters in Parramatta 11 days ago. Born in Lakemba, Leslie William Walker became a police cadet less than a month after his 15th birthday, on May 20, 1954, and a probationary constable on February 25, 1958. He went on to serve under eight commissioners between Colin Delaney and the present commissioner, Ken Moroney, both of whom he knew personally. A duty officer at Eastwood for his last years on the force, the still lean tennis player reached the rank of inspector in 1986 after more than 10 years as a traffic sergeant. He had not sought further promotion for various reasons. Moroney, who served under Walker as a probationary constable in 1965, had been in third class at St James Primary School, Forest Lodge, when the now retiree joined the force. “When you reflect on 1954, when the greatest shock jock on radio was Gary O’Callaghan and Sammy Sparrow, we seem to have come an enormous way forward,” Moroney said. “Or maybe we’ve gone back. The Police Minister, John Watkins, was not even born when Walker became a cop. “The world was different, policing was different and crime was different,” Watkins said. “To get up every day and put your uniform on and go out and do it again, despite what happened yesterday, despite what you saw, despite the belting you may have got, takes great strength, and Les has that. The shadow attorney-general, Andrew Tink, was so eager to join the nostalgia he excitedly claimed [incorrectly, by one year] that Walker was a police cadet before Edmund Hillary scaled Mount Everest. For his part, the man who upheld an oath to protect and to serve for 50 years was most thankful to his family: wife Lorraine, son Cameron, 21 and daughter Sarah, 18. He had joined the force, he said, because his parents told him: “Son, get yourself a government job and you’ll always have a pay cheque”. In 50 years the biggest change had been increased and improved training, but the basics of the job were still the same. “The bottom line is if you enjoy working with the community it makes your job a lot easier,” he says. “It’s a lot more rewarding. When you break it all down, what you’re discussing 95 per cent of the time is people and their problems. 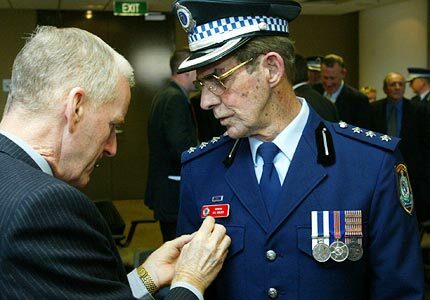 (Epping) [5.21 p.m.]: I pay tribute to the police career of Leslie William Walker, who was recruited as a police cadet on 20 May 1954 and on 20 May 2004 will complete 50 years of continuous service in the New South Wales police force. That is an all-time record—no serving or former police officer has served as long as Les Walker. Les is currently a duty officer attached to the Eastwood Local Area Command, which covers my electorate and the electorates of the Minister for Police and the honourable member for Lane Cove. Les has had an extensive career in the metropolitan area, which has seen him perform general duties, traffic law enforcement, and human resource management. He has also been a station controller and occupied staff officer positions, including in intelligence and operations. Les has been awarded the National Medal and is the only officer in any police force in Australia to receive three clasps to that medal. He was recently awarded the Centenary Medal—I believe he is one of very few police officers to receive it—and the NSW Police Medal for his long service. The medal was inaugurated recently for long-serving police officers. On Australia Day Les was awarded the Australian Police Medal, which is not usually given to an officer of his rank, which reflects his long and distinguished service. Today Les Walker was on duty from 6.30 a.m. until 4.30 p.m., when he clocked off and I had a talk to him. He is back on duty tomorrow morning at 6.30 a.m. and will work another 10-hour shift. I have spent a night in a police car with Les. He is 64 years of age, rising 65, and is lean and fit. He has a young family, who he says keep him young. Even in his sixties, Les has literally continued to chase crooks—I know because I have seen him. Les has never given up. He has not been sitting behind a desk for 20 years; he has been on active police duty for the whole of his time with the force. It is important to put that point on the record. I am indebted to Alex Roberts, a student from Cheltenham Girls High School who has been doing work experience in my office this week, for trying to put Les’s career in context. Les joined the police force before police Ministers were appointed. We believe the first police Minister he served under was Mr Downing, who was followed by Mr Mannix, Mr Askin, Mr Waddy, Mr Wran, Mr Crabtree, Mr Anderson, Mr Paciullo, Mr Pickering, Mr Griffiths, Mr West, Mr Whelan, Mr Costa and the current Minister for Police, John Watkins. Les has been in the police force since before the Minister for Police was born—I regret to say that I was born shortly before that, but thems the breaks. Les served 10 police commissioners: Colin Delaney, Norman Allen, Fred Hanson, Mervyn Wood, James Lees, Cecil Abbott, John Avery, Tony Lauer, Peter Ryan and Ken Moroney. I have tried to get a handle on what was happening in 1954 when Les joined the police force. He joined as a cadet nine days before Edmund Hillary climbed Everest on 29 May 1954. It is interesting to try to put 50 years of continuous service in an historical context. Les’s service predates the active careers of anybody in this Chamber and in most other areas of the work force. I wish Les all the best for what I am sure will be an active retirement after 50 years in the force. From what I know of him, I am sure that until his last day in the force Les will do his job on the front line with vigour. I have witnessed him doing that job while in his sixties. I thank Les for his career with NSW Police. (Ryde—Minister for Police) [5.26 p.m.]: I thank the honourable member for Epping for raising this matter as a private member’s statement. I, too, offer my personal congratulations to Inspector Walker for his outstanding services to policing throughout the Sydney metropolitan area. As we know, Inspector Walker joined the police force as a cadet in May 1954. He later served as a traffic sergeant for more than 10 years before being promoted to inspector in December 1986. Inspector Walker has served in various commands across the metropolitan area, in roles including general duties; staff officer, intelligence and operations; staff officer, personnel; and station controller. Inspector Walker is currently a duty officer at Eastwood Local Area Command, which is in my electorate and I am very proud to have him serve there. Inspector Walker is well known for his ability to pass on his vast experience and knowledge to younger officers, and he has played that important role with the many young officers who have come under his care throughout his long career. Inspector Walker’s career reflects the highest level of personal integrity, leadership, and commitment to policing. This was recognised in 2002 with the award of the National Medal and the 45 years clasp and, in May 2003, with the Centenary Medal for service to the community as a police officer. Inspector Walker should also be congratulated on his recent receipt of the Australian Police Medal. NSW Police encourages its officers to strive to provide the best possible service to the citizens of New South Wales. The award of all these medals, particularly the Australian Police Medal, is evidence of Inspector Walker’s great work on behalf of the community of New South Wales. All members wish him the best upon his retirement.